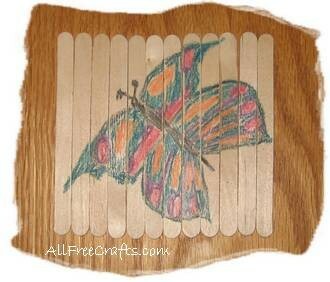 Don’t throw away your popsicle sticks this summer – save them up until you can make colorful insect puzzles as a challenge for friends and family. For groups who can’t save enough popsicle sticks, an alternative would be buying inexpensive craft sticks from the discount store or ordering a package online. Assemble the popsicle sticks either horizontally (running from side to side) or vertically (running up and down). Remember that part of the picture that you draw must appear on each of the sticks, so don’t make the area too large. Use two strips of sticky tape to hold the sticks together. Cut each strip a little longer than you need and let a little bit of the tape stick out at each end. Turn the joined sticks over and draw your picture. Caterpillars, moths or butterflies, beetles and ladybugs all make good subjects. But there are lots of other colorful insects too. When you are finished drawing, turn the puzzle over again and remove the tape. If you flip over the puzzle sticks without mixing them up, you can see how the completed puzzle looks. Most jigsaw puzzles come with a picture of the completed puzzle to help you put them together. You can do this too. Take a photo of your creation with a digital camera, then print the picture and cut it out. Glue the picture to the front of a plastic zip bag or slip the picture inside the bag. Add the popsicle stick puzzle and close the zipper. This is a simple camp craft that can be adapted for many different study themes. If desired, children can exchange puzzles with their friends. It is also a nice summer activity for the cottage, or a rainy day activity at any time.